I am going to make the 2017 Pattern Folio available, for free, for 24 hours so that any regular followers, subscribers or visitors can get their hands on a copy. 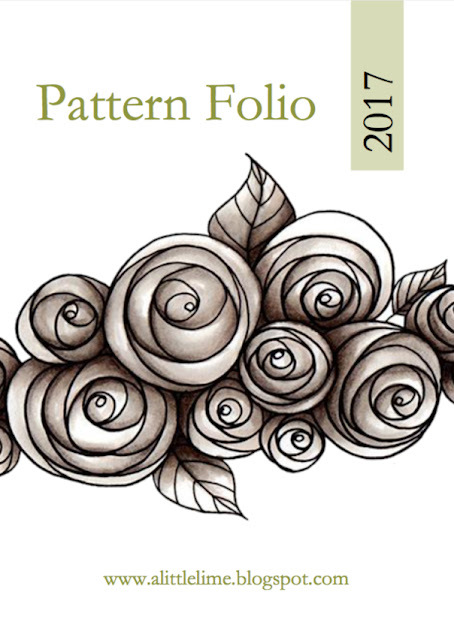 THIS GIVEAWAY HAS EXPIRED THE 2017 PATTERN FOLIO IS NOW AVAILABLE FOR PURCHASE HERE. Remember to get onto it fast as it will not be available after 24 hours. Happy Valentines Day and love to you all! Wow! So glad I decided to check my feedly before going to sleep! The link worked as far as I can tell! I purchased your portfolio last year and I'm really excited ;) Thank you so much for sharing!!!!!!!! Helen, Thank you so much. The link worked and the download was a success. Happy Valentines Day to you and thank you so much for sharing your talents and hard work with us. Helen, Happy Valentines Day ❤️ Thank you sooooo much for sharing, no problems with downloading. It is your beautiful heart we see in your beautiful art! Happy Valentines Day and thank you so much for this gift. I could easily download the files en secured them on my computer. Helen, your evil genius worked wonderfully. Thank you from the bottom of my heart for sharing all your hard work and wonderful patterns. It brightens up my day when your posts appear in my in box on a cold grey day! You are an amazingly talented and generous person, and thank you so much for a successful download from London! Yippee...or whatever noise guinea pigs make when they're happy! The download worked perfectly and thank you so much for another beautiful ebook. I sent you a message via that link but I guess I could have just commented. LOL! download link worked. Thank you so much. I am reaching for my doodles and line work again. this is just the inspiration I need. Thank you so very much. I know I will enjoy working on the wonderful patterns you provided. It was very generous of you to provide these at no cost!!!! Thank you again! Happy Valentine's Day, Helen. Thanks for the gift of this e-booklet. Thankful for you from the state of West Virginia, USA. The download worked! Thanks very much! thank you so much for your dedication and generosity. It came through wonderfully. Love all your artwork. your ideas into my own creations. Thanks Helen. Very generous of you considering the amount of work that it took to create it. Your work continues to be an inspiration not only to me but many others. I have to get back to tangling. Just downloaded a copy to my drive and it worked perfect. Thank you so much for being such a creative and generous person. I'm always so inspired! Thank you so much for the Valentine’s Day gift! The download worked perfectly. Your e-book is just beautiful and your artwork is awesome and always inspiring! Thanks again for sharing it with us.